HRSS-150 Digital Rockwell & Superficial Rockwell Hardness Tester features high measuring accuracy, reliable performance and applicable to wide fields. 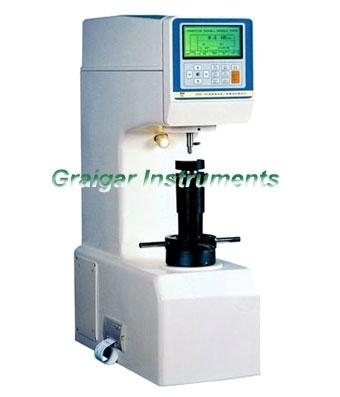 It is used for hardness testing of all kinds of Rockwell and Superficial Rockwell. And has big screen to display. It has a lot of functions such as scale selection, match hint of indenter, contrast for Brinell, Rockwell and Vickers hardness value, keeping the increase and decrease of time, data dispose, storage, pick up, print, adjustment of illuminating brightness, and RS-232 computer output as well. And serves to measure the hardness of hard metals, carburizing steels, quenching steels, mild steels, hard cast irons, Al, Cu and malleable irons.